To a regular cryptocurrency user, it is not news that transactions on the bitcoin are not private—at least not as private as most people are used to. To use bitcoins, one may not necessarily need to tender a name, email address or any form of identification. This is however as private as a bitcoin transaction can be. Once on the blockchain, transactions are open to everyone. The sender’s address, recipient’s address and amount of BTC transferred can be tracked by anyone on the blockchain. It becomes worse when a person or organization has been associated with some bitcoin address; people can monitor the on-chain activities of that entity. Not many people are comfortable with this level of transparency and therefore look for a means of hiding their transactions. But bitcoin does not have features inherent, that allows a user to hide details of transactions. Although cryptocurrencies like Moreno (XMR) and ZCash (ZCASH) allow users to hide transaction details, switching to altcoins fort this purpose is really not an option for many bitcoin holders. A method bitcoin users hide their transactions is by pooling them together and retrieving the same value. This is basically what happens when one deposits bitcoin with an exchange. However, the exchange (most of which require your ID), will keep a record of the transaction. This brings the need for third-party tumbler services like blender.io whose sole purpose is to help users shield the tracks of their transaction. 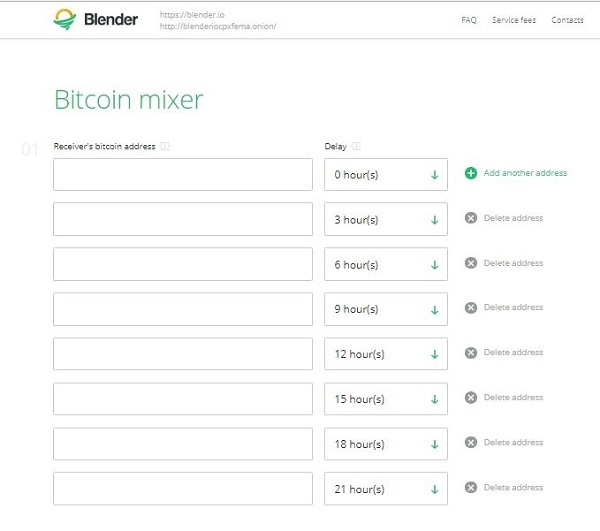 As a bitcoin tumbler, Blender.io mixes the bitcoins you send to it with coins from other sources and sends you back a set of coins different from the ones you sent in. Blender maintains a bitcoin reserve which is basically a chain of bitcoins. When a user sends bitcoins, it adds it to the pool and sends a fresh coin to the user. The coins, therefore, could only be tracked until it the moment they were sent into the pool, afterward, it’s a different unlinked coin. Certainly, the most important index one want to know when using a bitcoin tumbler is how effectively it hides the transaction path. This is after all the reason one will seek to use a tumbler in the first place. In this regard, blender.io rates high. Secondly, blender.io allows up to 8 receiving addresses to further obscure the transactions from any prying eyes. The transaction will be anonymous enough even if it was sent to a single address. But splitting the coins to several addresses makes it almost impossible to be traced back to the owner. Most services with provision for multiple addresses usually allow 5 or fewer addresses. Thirdly, blender.io allows users to set custom time delays between the time their coins go in and the time they receive fresh coins. The longer the delay period, the more difficult it is to link the new coins to the ones. Whereas other similar tumblers allow about 3-4 sets of delays, blener.io allows a massive 24 sets. Fourthly, blender.io has a peculiar feature that ensures that coins you send to a platform are not sent back to you anytime in the future. Its system uses a “Mixing Code” which the user fills along with other requirements. For instance, if a user sends I BTC each on two different occasions, the mixing code informs the system that both transactions are from the same user and prevents the system from sending coin from either transaction back to the user. It makes sure none of your coins you sent in the past are mixed and returned to you. Finally, blender.io does not retain any logs or traces of any transaction”, which is good news to the ears of privacy exponents. Most tumblers delete logs after transactions but retain some logs for support. Blender.io has a strict “No logs policy”, and never to retain any logs for any reason whatsoever. The blender.io website is as simple as a bitcoin tumbler can be. It is also very intuitive. A newbie with little with little knowledge of bitcoin services can make sense of the platform. The homepage, where the transaction happens, is neat and has this matter-of-fact feel to it. You don’t need to navigate or click much to get your job done. Blender uses custom fees which range from 0.5% to 3%. The user also pays a fee of 0.0001BTC per receiving address. The minimum amount of bitcoins you can send to be mixed is 0.01 BTC while the maximum depends on the current value of their reserve. Anything below the minimum is considered a donation. In the field provided, enter the bitcoin wallet address you would like the coins to be sent to after tumbling. As I mentioned earlier, you can add up to 8 different addresses. Set the delay; the period between the time you send your coin and the time you receive it. This is optional but like we discussed, you can use this to increase the anonymity of your transaction. If you leave the delay at zero, you will receive your coins immediately after you send. Add additional address(es) where the coins will be sent to. Again, this is optional. If you’re a fan of custom delays, you can add custom delays for each address you add. Set a transaction fee from a dropdown list. Starting at 0.5 to $3 % maximum, you can choose how much fee you wish to pay. Click on continue to generate the bitcoin address where you will transfer your coins. The address is valid for 24 hours. Finally, send in your bitcoins to the address generated in the previous step. Ensure you send the coins before the expiration of the address you generated. Blender.io platform processes the order as soon as it receives the coins and sends it to the designated address(es) depending on your settings. Heads up. After sending your coins, the platform will ask for 3 confirmations before it processes the order. Let me know in the comment section what your experience with blender has been and what feature you like most.